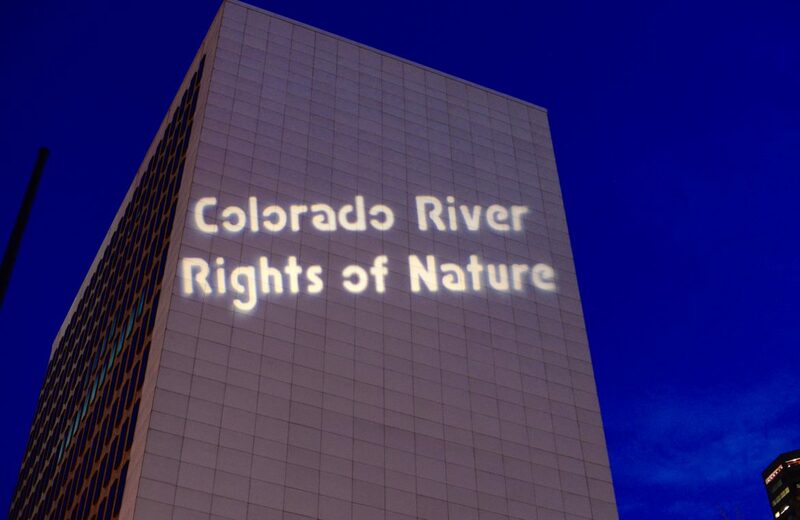 Protesters advocating for "personhood" rights for the Colorado River cast the words, via a projector, "Colorado River Rights of Nature" onto a building in Denver on Friday Dec. 1, 2017. 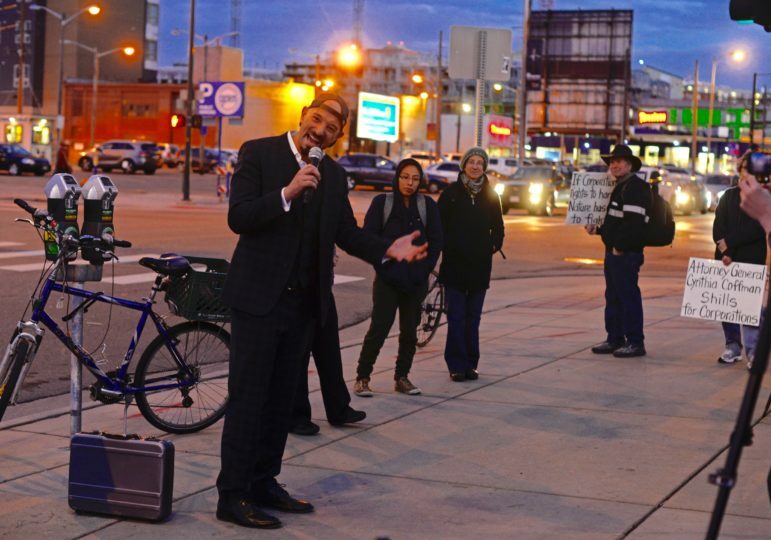 DENVER — Protesters spurred on by the environmental group Deep Green Resistance gathered at dusk in front of the Alfred A. Arraj Courthouse in downtown Denver Friday. High above their heads, the words “Colorado River Rights of Nature” loomed, lit by a spotlight projector placed outside the protester circle. 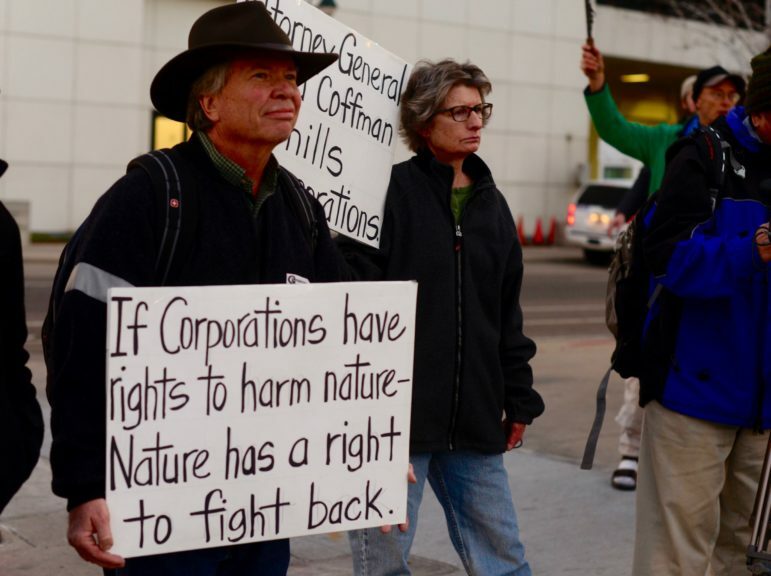 The activists had come in support of a first-of-its-kind lawsuit in the United States, the Colorado River Ecosystem v. the State of Colorado, which seeks to grant direct rights to nature in the U.S. If successful, the case would allow anyone to file a lawsuit on behalf of the Colorado River ecosystem, including all the river’s tributaries. And even as the protesters gathered on Friday, the attorney general’s office filed a second motion with the federal court to dismiss the lawsuit. A Dec. 1 deadline to do so had been set by the court in response to an amended complaint filed by the plaintiffs on Nov. 6. Jason Flores-Williams, the lawyer representing “The Colorado River Ecosystem,” speaks to protesters outside the Alfred A. Arraj Courthouse in downtown Denver on Friday, Dec. 1, 2017. Protesters carry signs outside the Alfred A. Arraj Courthouse in downtown Denver on Dec. 1, 2017, during a rally supporting a case to give the Colorado River personhood. In Colorado, this type of legal thinking is particularly sensitive with water resources due to the state’s complex and deeply entrenched system of water rights. Many legal experts believe the rights-of-nature case has little chance of going forward, but it does come at a pivotal moment for the future of managing the Colorado River. Editor’s note: Aspen Journalism is collaborating with the Glenwood Springs Post Independent, The Aspen Times, the Vail Daily and the Summit Daily News on coverage of rivers and water. The Post Independent published this story on Sunday, Dec. 3, 2017.